Check out the rest of our 2019 Professional Development dates. 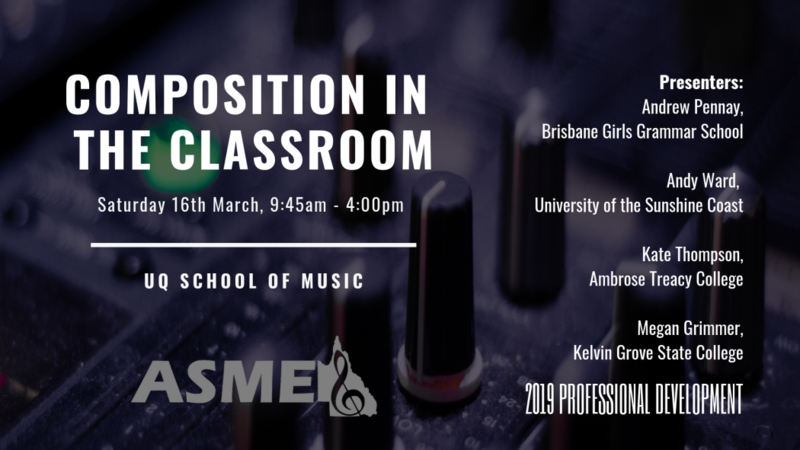 One of the core aims of the ASME Queensland Chapter Council is to provide high quality, relevant and accessible professional development for our members and potential members who are involved in Music Education throughout Queensland. We aim to provide a broad spectrum of PD opportunities across all education sectors and age levels and in recent years have focused on providing PD opportunities in regional locations throughout Queensland. 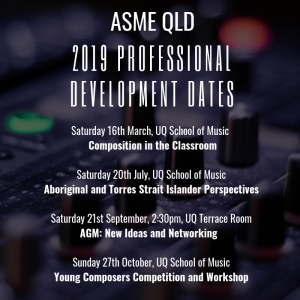 Our highly dedicated PD Coordinator Sarah Fry works tirelessly with our presenters to ensure exceptional value for money when you attend an ASME Qld Professional Development event. We provide discounted workshop fees for our members and full-time students and this is just one of the many benefits our members receive each year. If you have any questions regarding any PD event, please contact Sarah via our Contact Us page.